OLD PARKED CARS. : 1981 Ford Durango: Best Worst OPC Ever? 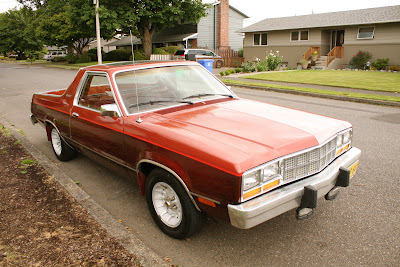 1981 Ford Durango: Best Worst OPC Ever? 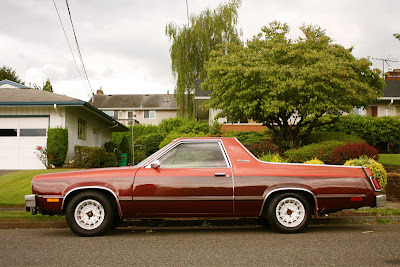 After production ended for the beloved Ranchero in 1979, Ford still needed something to compete against GM's El Camino. Solution? Send some Fairmont Futura coupes to be rebodied as pickups by the National Coach Corporation. Power came from the 200-ci "Thriftpower" six with 3-speed auto. Ford kept no records, but production is estimated at about 200 examples. And here is one of them. I've never seen this one drive, but I've seen it parked at different points along the curb, so I know that it moves. Notice the Fairlane taillights integrated into the tailgate! I've never heard of this. It must be more rare than a GMC Sprint even though you haven't added one yet. I've seen a couple of these. probably the coolest version of the fairmont ever made although the coupe doesn't look too bad either. pretty cool find. I'd love to see what other OPCers vote as the worst of all time, but this is definitely in a class of its own. Bravo on a definite best of. That's certainly the funniest wheelbase I've ever seen in a profile. Amazing amount of space in the back, but what the heck could this thing be rated at? 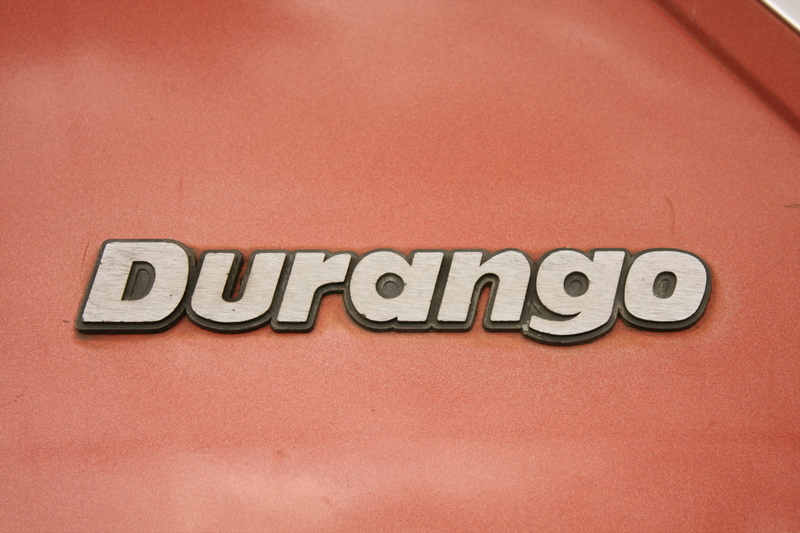 That Durango typeface is way ahead of its time, and that two tone paint saves the day. Wow! Indeed a great one! There's one of these things near me in Grand Terrace, CA. I've always wondered how the tailgate folds down without breaking those huge taillights. apparently my early morning comment didn't make it on. While certainly not The King, hardly the worst OPC by any consideration. Very clean & most excellent wheels. Well, I think this is actually a pretty cool car. It's cool that it is clean and straight. I don't think it is ugly, by any stretch of the imagination. Now, if it had been horribly neglected, modified in some 'orrible way, fitted with ugly wheels or allowed to fade and rust into oblivion, then, then it might be considered ugly, but not in its current condition. You've had lots of other ugly cars on the blog that are more memorable but i do really appreciate the motivation and thought that went into this blogpost. Wonderful work Tony. I like it. Have not seen one before. Bonus points if it has a red crushed velour interior. The proportions are a bit weird but it it spells 'SINGLE AND ABLE' well enough. i take it that you all appreciate the car but don't share my assessment of it as the best worst post ever. thanks to the commenters for being polite, although i assure you politeness is not necessary. here is what the car represents for me. the whole point of this blog is to celebrate the honest, humble daily drivers of bygone decades. that includes a heavy emphasis on the "malaise era" 1970s and '80s. while i respect the engineers and designers who toiled to develop desirable cars in the face of joy-killing emissions and safety regulations, the idea of adding "swag" to a ford fairmont is a stroke of marketing folly so transparent that it makes me wince. in my opinion, the contrast of the half-executed truck bed serves only to highlight the iconic lameness of this entire chapter in automotive history. the fact that FoMoCo sent completed fairmonts to be un-done by National Coach Corporation (the least-cool name of any company that i can think of at the moment), along with the fact that they chose to do so few, adds a strange, unofficial flavor to the story. it's truly rare, but i find myself struggling to articulate the significance of that word in this case. 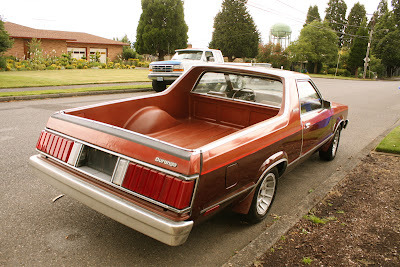 the internet tells me that fairmonts of this era were often chopped into durango clones. this one's tailgate gives it away as the real deal. i'm glad i don't have to work through the psychological layers of a replica durango here. 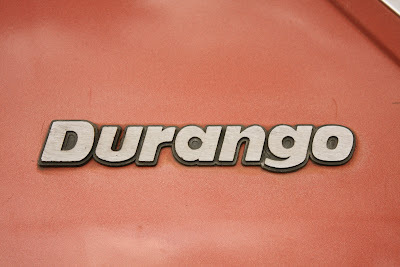 if a durango owner ever reads this, i hope that my words don't sound unfair. while i can't fake any respect for this car, i do respect the care that the owner has shown for it. it's an amazing piece of history that deserves to be preserved. if this car showed up at a local cruise-in, i would walk right up, shake the owner's hand and listen to everything he had to say. I see Oregon Plates. Where in Oregon? I live near Portland area. Awesome find. I've loved these since I first found out about them. The Fairmont just looks right as a pickup and I have no idea why. "I've seen a couple of these"
@ joey ,they made more than a few. I saw one on the street one time, I was not aware if it was done by a custom shop or by an owner so I had to look it up and there were plenty of other pics of ones other people had on the net. Whoever drives this thing better have a mullet. @MBReally-Don't forget listening to 80's glam/hair metal, lol. Never saw one but like it! And there was a Chevy Durango. In the 1st Generation S10. National Coach went onto building triple axle limos, some with pools in them. Tony, since I hear your selling your HiLUx, I think you should buy this, if it is still for sale. Why not buy it? * One owner, original hupcaps (mot of the wheels have been changed), only 212 made, pickup bed for utility, and documented local ownership. You can haul your bike in the back! It has maximum utility! You can own one of the least produced cars ever! It is a real Durango based off the lights and tailgate, btw. *Unless you wanted to be shunned by your friends and family.